After being tipped of on the Sun try-and-buy program by Alan Baker, a coworker and cohort, I figured I’d throw my hat into the ring for a chance to test drive a SunFire T2000… and today it arrived. Toss your toughest workloads at the multithreaded Sun Fire T2000 server with the Solaris 10 Operating System, and watch it crank up your database and Web application performance. We’re so confident in the quality and performance of the world’s first eco-responsible server, we’re offering a free 60-day trial, risk-free. If you’re not totally impressed, just send it back at our expense and owe us nothing. Chances are that you will be dazzled by your trial server and come back for more. The new Sun Fire T2000 server will likely become your multithreaded workload energy-saving powerhouse of choice. When you apply for the Try and Buy program you get the choice of a four, six, or eight core 1GHz UltraSPARC T1 processor. I chose the eight, not just because bigger is better, but also because it is closest to our production Oracle servers in capacity and price. So once we can find the time we’ll get 64-bit Oracle installed on there and run it through the paces. On deck are some join, function, lookup intensive datamart creation scripts which currently crush our production server every evening. This should be fun. 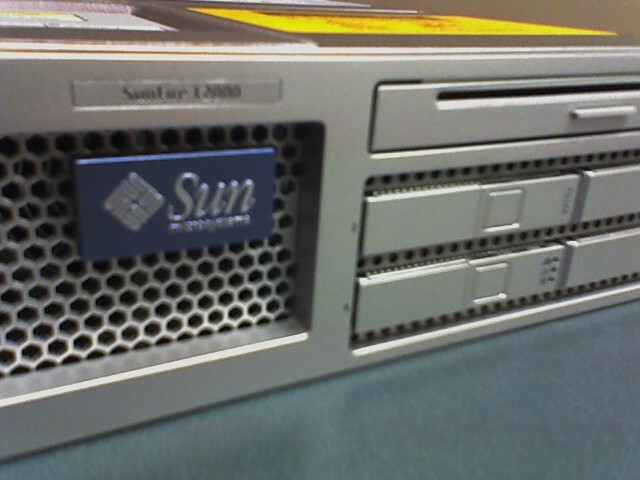 Also of interest is Sun’s claim of this server being “the world’s first eco-responsible server”. While I am unlikely to bring in a kilowatt meter to verify these claims, we are a very green university and hey, everyone wants to save a few bucks on electric. UPDATE: I have now had the chance to test drive some Oracle jobs on this system. Check out my findings here. I want to ask if Oracle runs without a problem on this system? We are in the process of buying v440 server or T2000 series. One thing that I have noticed that it comes with one CPU and multiple core. By the way can Solaris 8 be installed on T2000? Have you tried to install that? I really need some advice about this situation. Omer, I have to admit that we have not had time to get Oracle on the T2000 yet. We just got it up and running yesterday in fact. We’re hoping to get Oracle on it later today. I can tell you that we run several v440s with Oracle on them and they perform very well. We have them configured with 4 processors and 8GB RAM and run several Oracle 9 databases on them with no problems. From what I have read, the T2000 requires Solaris 10, but I’m sure the Sun sales guys could advise you on that. We have no intentions here to change the OS out. As I get a chance to test more on this system I will post my findings on my blog. Thanks for your interest. I got my T2000 try-and-buy yesterday. I spent today benchmarking it as an Apache server and am VERY impressed. A single T2000 would be able to replace our web cluster of four dual cpu V210’s. In the comming weeks we will put Oracle 10g on it as well as test it in our appliation cluster. That’s great to hear Adam! How are you going to measure performance of your Oracle stuff? I’m planning on throwing some long, complex queries at the db and comparing run time against our V440s. I wonder how Sun is achieving 32 threads on an 8 core, single processor chip. I’m somewhat familiar with hyper-threading, but it seems like Sun is doing more. I’m not entirely sure how we’re going to benchmark Oracle. That will be left with our DBA’s. There are a number of queries that tend to grind our database to a halt as well which we will test against. We currently run an Oracle 10g RAC on four dual CPU HP DL380’s. Our Oracle licensing fees are astronomical so we’re looking to save money where possible. I too am very impressed with Sun’s ability to push 4 threads through a single core. Intel has the same ability but only on their single core CPU. Any more updates on where you are with benchmarking your T2000? I would love to see some comparisons against V440. Besides some single query benchmarks, how about some tests where you scale up to a 100/200/(whatever makes sense ) sessions? We are “thinking about” how much the T2000 might make sense for us. I hope to have some numbers soon. Unfortunately we do not have the facility to simulate hundreds of sessions. We’re shooting for dozens running some very complex datamart and data warehousing scripts. If you think the T2000 might be good for you apply for the try-and-buy program. Their support thorugh the trial has been great and if we decide against it we’re not into it for anything. We are considering using one to replace a loaded V490 Oracle DB in production. We are doing a lot testing and so far it has been VERY positive. It’s the one instance where the sales hype doesn’t even do it justice, the performance on heavily multi-threaded load was amazing. We also put one into an application server role and it seems to be out-performing our V280s by a long shot. So, from our experience the T2000 excels exactly on what the glossy states, multi-threads! It’s really worth developing Apps and program your DB with that in mind. We have a similar situation to Adam, with large Oracle licensing costs – So, having a T2000 to replace a 4 CPU V490 is a great deal, specially considering that our currently licenses will cover a RAC with 3 T2000s nodes. Best of luck to you. Just remember that if you have large processes you will really notice a performance degradation!